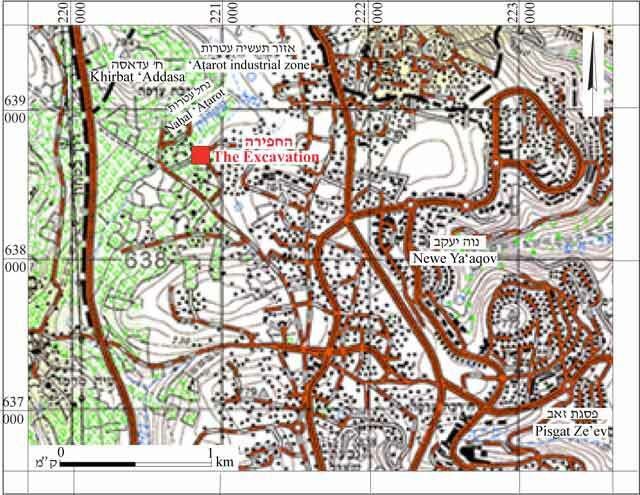 In November 2006, a salvage excavation was conducted in the Beit Hanina quarter of Jerusalem (Permit No. A-4951; map ref. 22095/63873), prior to construction. 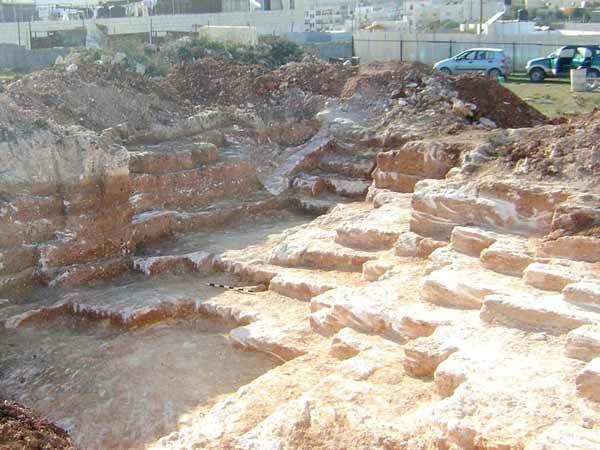 The excavation, undertaken on behalf of the Israel Antiquities Authority and financed by Ahed Osselleh, was directed by Z. ‘Adawi (field photography) and B. Touri, with assistance from T. Kornfeld and V. Essman (surveying and drafting) and L. Barda (GPS). 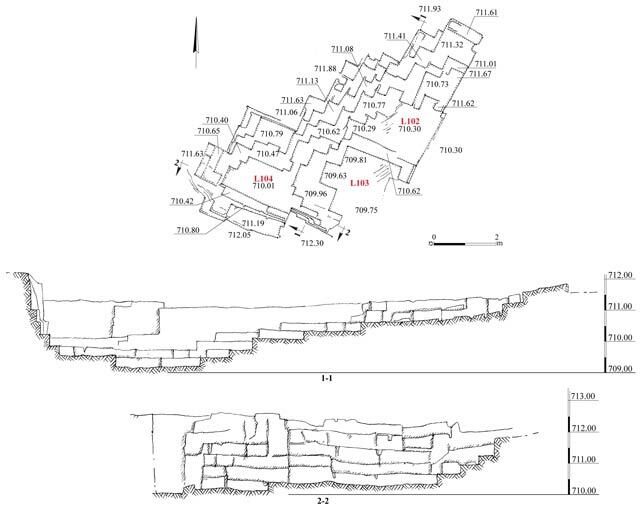 The excavation area was located on a slope descending northwest, toward Nahal ‘Atarot (Fig. 1). On the other side of the stream, c. 700 m to the northwest, is Khirbat ‘Addasa, at whose foot passed the Roman-period ‘Bet Horon Road’, leading from Jerusalem to Lod (Kloner 2002: Sites 1–5). The indigenous soil is terra rossa, and the natural bedrock outcrops in many places. The excavation revealed part of a quarry. 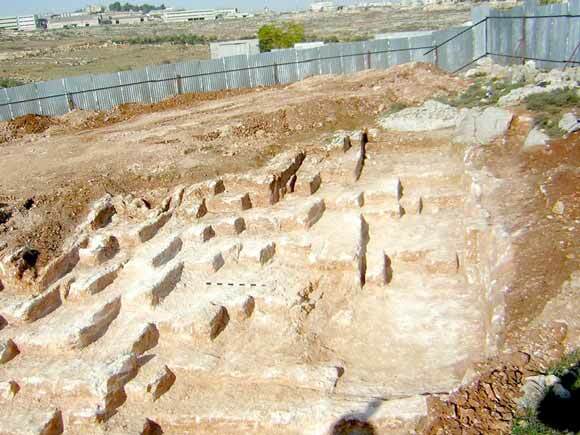 Recent surveys and archaeological excavations conducted on the hills south of the excavation exposed many quarries, which probably served Khirbat ‘Addasa or other sites in the vicinity (‘Adawi 2007a; ‘Adawi 2009; Mizrachi 2008a; Mizrachi 2008b). The quarry (max. length c. 16 m, max. width c. 9.5 m; Fig. 2) was covered with three layers of soil. 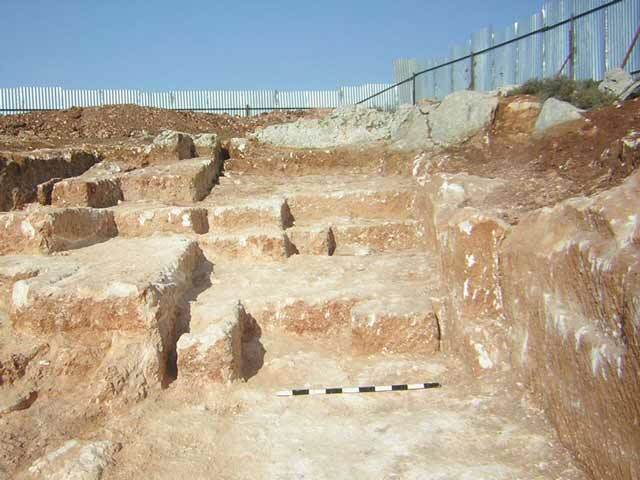 The upper layer (L100; average thickness 1.5–2.0 m, not on the plan) contained terra rossa soil that had been washed onto the site from the southeast. The middle layer contained light brown soil fill mixed with quarrying debris (L101; average thickness 0.5 m; not on the plan). These layers were excavated using mechanical equipment. The bottom layer (average thickness 0.2–0.4 m) was excavated manually and contained yellowish-light brown quarrying debris (L102–L104). Five to seven quarrying levels (Figs. 3, 4) were identified. The quarry lines, and several undetached stones surrounded by severance channels (width 0.1 m; Fig. 5), indicate that different-sized stones (length 0.5–1.0 m, width and height 0.3–0.4 m) were hewn in the quarry. Several worn, non-diagnostic sherds were discovered in the bottom layer. No datable finds were discovered in the quarry; however, on the hill to its south, numerous quarries were documented and excavated that were similar in shape and utilized the same quarrying methods. Some of these were dated to the Byzantine and Early Islamic periods (Mizrachi 2008a; Mizrachi 2008b). This leads us to conclude that the quarry discussed here may have operated in these periods and served the nearby sites: Khirbat ‘Addasa (‘Adawi 2012), located very close by, Tell el-Ful, c. 3 km to the southeast, or Khirbat Hawanit, recently discovered c. 2.0–2.5 km to the southwest (‘Adawi 2007b). ‘Adawi Z. 2007a. Jerusalem, Shikune Nusseiba (A). HA-ESI 119. ‘Adawi Z. 2007b. Jerusalem, Shikune Nusseiba (B). HA-ESI 119. ‘Adawi Z. 2012. Jerusalem, Khirbat ‘Addasa. HA-ESI 124. 3. The eastern part of the quarry, looking north. 5. Stones, left undetached in the bedrock, and severance channels, looking north.